At first glance, Puerto Jimenez is not much to write home about. It’s just a small town next to the bay. Typically in Costa Rica, I find that every town exudes a particular vibe. With Puerto Jimenez, I did not get that feeling. However, after spending a few days in the area the town grew on me. I realized the reason it did not have a particular vibe is because it is still a local town. There are tourists in Puerto Jimenez, but not to the extent that you see in other towns in Costa Rica. It has stuck to its roots and I like that about Puerto Jimenez. With just a short drive out of the town, you can visit beautiful beaches with turquoise waters and lush jungles filled with wildlife. 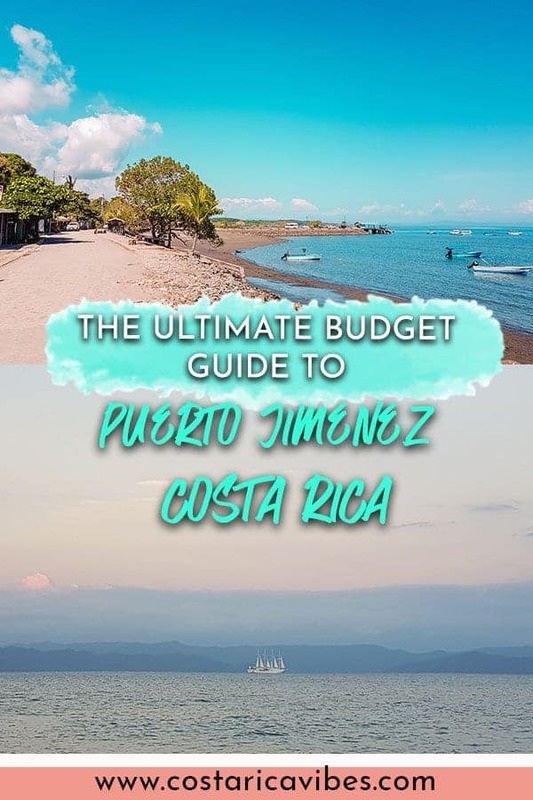 Alright, let’s get to planning your perfect trip to Puerto Jimenez Costa Rica! We visited Puerto Jimenez in January and it was pretty much the warmest place we’ve been in Costa Rica. It was in the upper 90’s every single day we were there. The area follows a similar weather pattern to the rest of the Pacific coast. You can expect hot and dry weather from the end of December until April or May. After that, the rainy season begins. During the rainy season, you can expect afternoon rainstorms that come like clockwork. From September until December the weather becomes kind of unpredictable. You may have days that are complete washouts and other days with perfect weather. We suggest flying into San Jose airport if you would like to visit Puerto Jimenez Costa Rica. From the San Jose airport, it will take you about six hours to drive to Puerto Jimenez. This is actually a really nice drive because it goes past a bunch of other beach towns on the way down. The road is also well maintained the whole way. Just make sure that your GPS directs you along the coastal road by Jaco and Manuel Antonio and not through the mountains. The trip through the mountains is rough! If you need a good place to pull off for a quick lunch along the way we suggest stopping in Dominical. It is about halfway into the drive and really easy to pull off into Dominical from the main road. There is a cute fish and chips shop called Pescado Loco that makes some killer fish tacos located right in the downtown area. We like to stop there because it is a great place for a quick but tasty lunch. We suggest using Adobe for your car rentals because they are the most trustworthy rental car company in this country (in our opinion) and we have a 10% discount for you. You can read more about renting a car here. If you do not plan on renting a car you can also take the public bus to Puerto Jimenez. The bus runs twice daily at 8:00am and 12:00pm from downtown San Jose. The ride will take about 8 hours. Pro tip: Download the free app Off the Grid Traveler to see bus connections and schedules to and from everywhere in Costa Rica. It’s seriously a lifesaver. The downtown area of Puerto Jimenez is small enough to easily walk around. However, you probably won’t be spending much time in the downtown area. A lot of the fun activities happen away from the downtown. We had our car with us in Puerto Jimenez and it was definitely helpful. It allowed us to visit a lot of nice beaches that we would not have been able to get to otherwise. Also, if you do a tour to Corcovado National Park you can opt to have transportation provided by your tour company but it will be cheaper if you just drive yourself to the national park. We definitely suggest renting a vehicle with high clearance and 4 wheel drive. The roads around Puerto Jimenez are not paved and sometimes you will have to drive through rivers. Just keep in mind that this is a lot easier and safer during the dry season. During the rainy season, the water level can get very high. Pro Tip: Rent a car with Adobe through our site and you will get a 10% discount plus other great perks! Score! You can find out more about it here. Visit Corcovado National Park: The main attraction in Puerto Jimenez is Corcovado National Park. You can take one day or multi-day hikes inside the park. We recently had a chance to visit this Costa Rican gem and have a complete guide to the national park here. Go kayaking: There are several companies in town that offer kayak tours. However, if you would like to just do some paddling on your own you can rent a kayak from the restaurant IL Giardino located right next to the Puerto Jiminez harbor. Their kayak rental rates are $5 per hour for single kayaks and $8 per hour for double kayaks. Relax on a beautiful beach: There are plenty of nice beaches near Puerto Jimenez with bright turquoise waters. Our favorite was Playa Platanares. It’s a short drive from downtown Puerto Jimenez and you can just walk for miles there without seeing another person. We suggest having a car with 4 wheel drive though because the road near the beach is basically just sand. Hike up a waterfall: About an hour away from Puerto Jimenz there is a waterfall called the King Louis waterfall. The road to get here is not the best so you definitely need 4 wheel drive, but it is a fun free activity with great beaches next to it. Waleska’s Place: This is where we stayed last time we were in Puerto Jimenez and we really enjoyed it. It’s not anything fancy but we loved that these cabins each have their own kitchen and that this place is located directly across the street from a beautiful empty beach. Just keep in mind that this place is not located in the downtown area and you will need a 4×4 or at least all-wheel drive to get here. Cabinas Jimenez: The gem of Cabinas Jimenez is a nice small pool with a view of the harbor. Plus they offer free use of their kayaks and bicycles. Osa Lodge: Osa lodge consists of small cabins located a bit outside of the downtown area. They also serve amazing breakfast and have a pool for guests to use. Hotel Inn Jimenez: I think this place is so cute and just feels nice and homey. There is also a nice pool for guests to use on site. We definitely suggest checking out Airbnb as well. Sometimes you can get some really great accommodation deals at beautiful places on Airbnb. We like Airbnb because often you can get a place with a private kitchen. This definitely helps us to save some money so we are not constantly eating at restaurants. Also, often staying at an Airbnb will give you a more local experience. 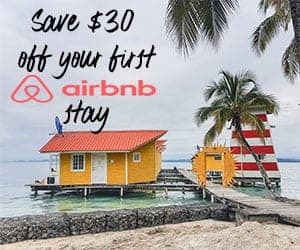 Save $30 off your first Airbnb stay here! Soda Jimenez: This is the place to go if you want delicious typical Costa Rican food at a good price. Plus their portions are huge! It may not look like much from the outside but try not to let that deter you. Pizzamail.it: This place has a cute and relaxed vibe to it. Their pizza is delicious but they also offer other great items such as tasty fresh fish. Marisqueria Corcovado: Super tasty fresh fish and seafood. We loved the outdoor seating with the view of the harbor. This is a great dinner spot, but bring bug spray! Soda Pura Vida: Another great spot for pizza, fresh fish, and typical Costa Rican food. This place is located right in the downtown area of Puerto Jimenez. – This area can get extremely hot. Don’t forget to drink tons of water and wear a lot of sunscreen. – Not so much in the downtown area, but the surrounding jungle and beaches are filled with wildlife. This includes some things like poisonous snakes and African killer bees. Just keep an eye out and be careful where you put your hands while hiking. If you get attacked in a swarm of bees you need to run in a zig-zag motion rather than straight ahead. WAS THIS HELPFUL? WE'D LOVE IF YOU'D PIN IT! 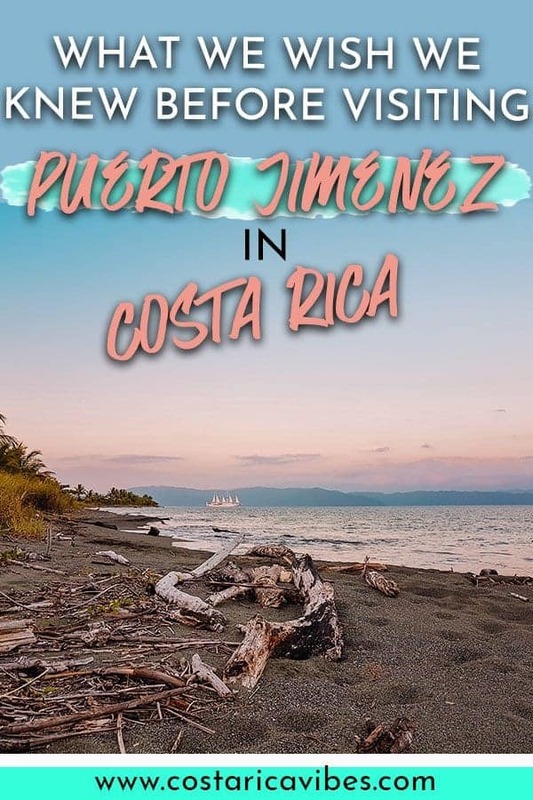 Let us know if you have any questions about visiting Puerto Jimenez Costa Rica in the comment section below. We are happy to help you out!